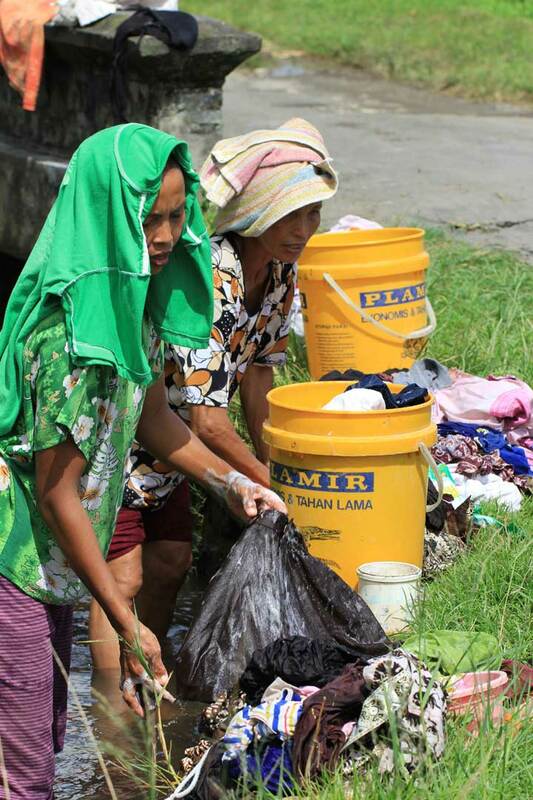 Down by the river the ladies of the kampung bathe themselves and wash their clothes. They were very sweet-natured and kindly allowed me to take these photos. It was an intimate moment as the young woman with the towel around her had been stark-naked just moments before. I asked them how long it takes to do all the household washing. Between two and a half and three hours they cried in unison! There they stand under the boiling sun; knee deep in the murky water scrubbing away with soap, then rinsing, before draining out the excess water and leaving the larger items to dry out on the ground around them. This ritual is carried out as many times a week as necessary and is mostly done as a group activity though I photographed a lady alone on the edge of a padi field doing her washing in one of the irrigation channels. 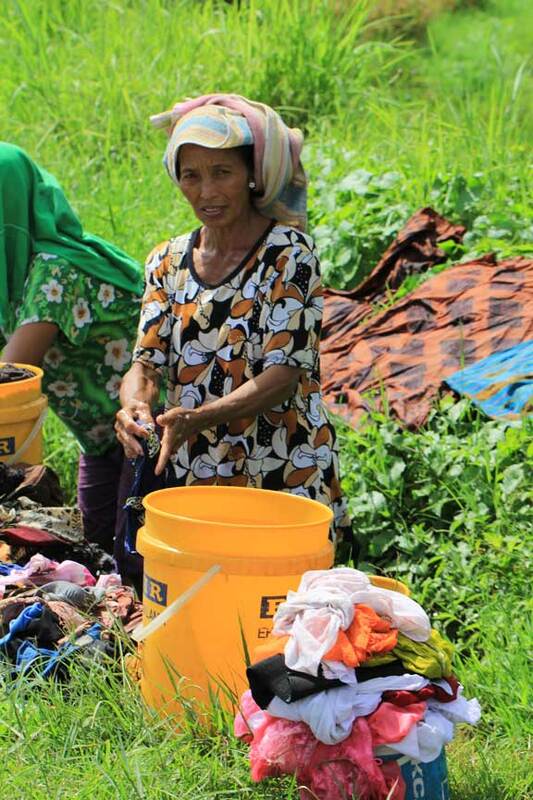 We can only imagine how hard life must be for these women. There is no bathroom just a squat toilet and bucket filled with water to wash from which is why the ladies mostly chose to bathe and do their hair washing in the river despite it being so public. No automatic washing machines to make life easier, just a bar of soap and a lot of elbow grease. You must have built up a good rapport with them Lottie to be allowed such images. A very thought provoking post. I love the banter and I think having a sense of humour helps. It goes without saying that I always ask permission before taking anyones photograph. I nearly always get a thumbs up to my requests, just occasionally I get a firm NO! No midwives in this kampung. If you have some money then you go to hospital to have your baby but most babies are born at home with no medical aid or supervision. When you die you get buried on the kampung for up to five years and then cremated along with up to 100 others (Hindu Cremation is very expensive and so the family has to wait until there are other bodies before sharing the expense. I will write a longer post about this) The ashes are then sprinkled on the kampung and in the jungle as it’s too far from the sea. Healthcare is very expensive for the majority of people in Indonesia. Most of the villagers try to prevent illness by taking herbs and home-made remedies. A visit to the doctor is a luxury and so is a trip to the dentist. 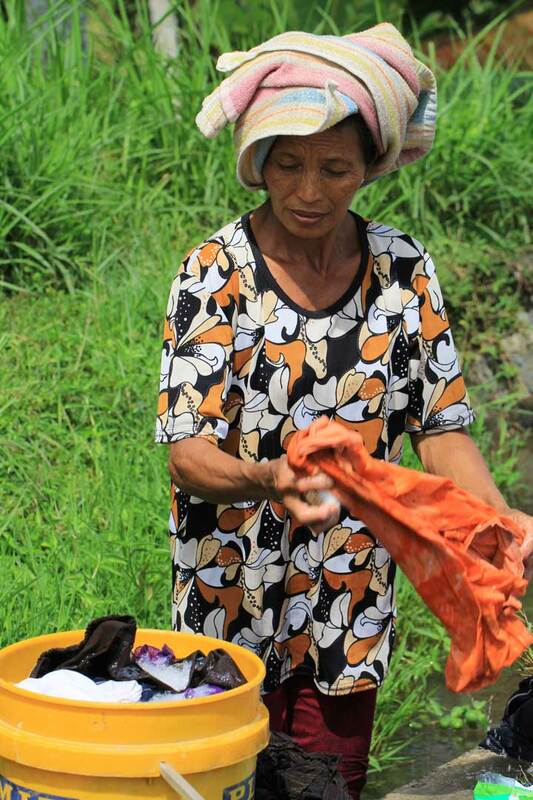 The kampung life is based on sharing and bartering. Exchanging goods. It’s a self-sufficient way of life very much like the agriculture of the UK in years gone by. Yes, to some it seems a poor way of life, But looking at their smiles, I don’t see that in the laundro-mats here. We have all those time saving machines but what happens and what do we do with the time saved? You are absolutely right Gerard. More smiles here than you ever see on the streets of London. Excellent point about what do we do with all the time saved? A visit to the kampung always leaves me with my head spinning with ideas and thoughts and questions. It made a huge impression on me the first time I visited over a year ago and even now when I visit it throws up many questions in my mind about life and lifestyles and what constitutes happiness, contentment etc. Much to think about and I’m sure that your comment wil have struck a chord with many people. Thank you. Lovely photos of some lovely women in a lovely place! While I’m not keen on trading in my washer for an irrigation channel, I do think my kids & I could benefit from stepping away from our technology a little more often. I think you are right. We lived for a number of years on a remote hillside farm in N.Yorkshire. We didn’t use mobiles then and neither did we have a computer. I decided to ditch the tv. The children were mad at me but then after a few days something marvellous happened. They started to make up games, write stories, spend much more time outside (even in the winter) and generally became a lot more involved with what was going on around them rather than be glued to a tv screen. They all look back on those days as the happiest of times. Great photos Lotties. I wouldn’t mind washing me in public but I am crap at washing clothes by hand. i can live without a lot of modern day goodies but a washing machine? Oh no. I have to admit that I’m not keen on hand-washing either. I’ve had to do it at times when the washing machine has konked out but it’s back breaking work and not in the least bit fun. I could do the washing in the stream or river no problem, especially here as it’s so warm. Maybe not so fun in the UK! Well presented as another example of how we in the west or more “developed” countries take so much for granted, Lottie. Imagine the hue and cry if we had to take cold showers much less public baths. Or our time away from the television or other wastes of life to spend it hand washing clothing….not that I am volunteering to give any of those things up. Inspirational yes, but also an example of life enjoyed in the little things without the cares of our complicated lives. 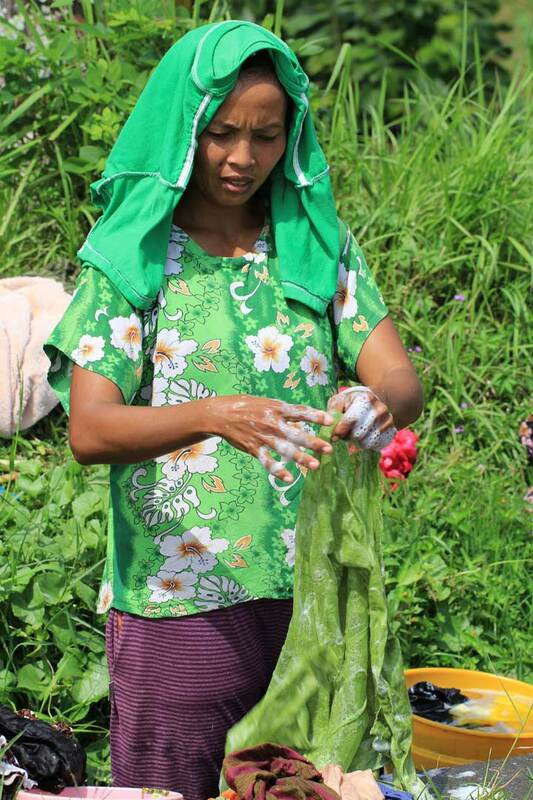 I hope my face didn’t reveal my disbelief and shut-my-mouth shock when Wayan took me to her village and showed me the dirty stream where they bathe and do laundry. I had just arrived in Bali and was fresh off the U.S. lifestyle…need I say more?! You are always smiling Sherry, I’m sure your face didn’t give anything away apart from your kind, and loving nature. Beautifully put Steve and I think you are right. The more technology we have, the more there is to go wrong. I also think it’s really lovely that these women spend so much time together. Bringing up children is wonderful but it can be very tiring and often quite lonely. In a close knit community such as this one I doubt that post-natal depression even exists as there is always company and help on hand. Sure, you have no labour-saving devices, but you do have the solidarity and companionship that is so important when you are a mother. Having suffered from post-natal depression and had times in my adult life when I’ve been quite depressed I know how much being a part of a community such as this would have really helped me get through the dark periods in life that many of us suffer. Steve, apologies! My response to your comment seems to have found it’s way under another comment! I’m so sorry! I’ll try and copy and paste it here for you to see. I’m making a right hash of things today! We take so much for granted don’t we? Beautiful women. What Gerard said about what we do with the time we save with all our time saving appliances resonated with me. This is a wonderful post, rich with vivid and real details. You did a lovely job writing about and photographing these inspiring women.